My family had relocated from Mililani Oahu to Barstow California in the middle of my 6th grade year. I was devastated to leave the only home I remembered. It was a difficult transition because I suddenly became a minority. I had no friends and we lived in a developing neighborhood with no kids and skeleton houses in various stages of becoming. 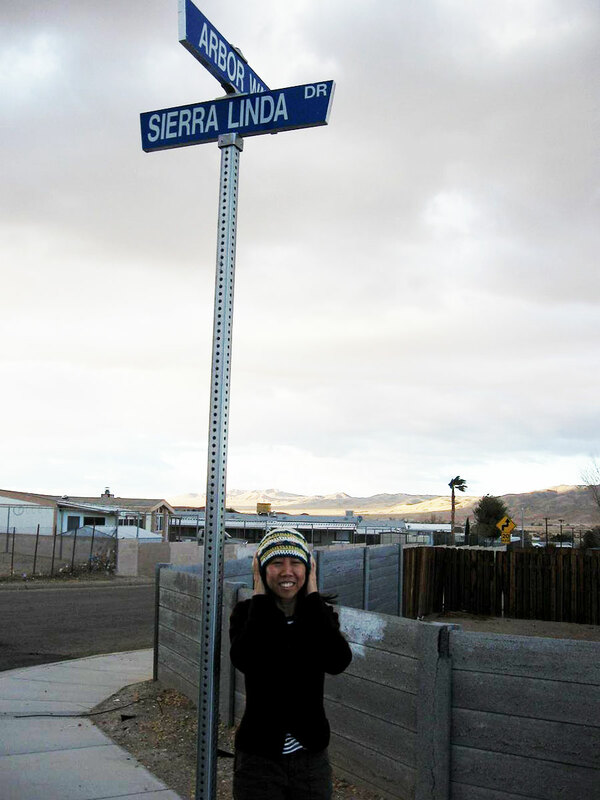 In 2007, I returned to Barstow and the street we used to live on. It was super windy that day, typical desert weather! Now most of you can picture Hawaii, but perhaps you cannot picture Barstow California. It’s one of the great armpits of America. A stop over between L.A. and Las Vegas. A small town in the middle of the Mojave Desert. Not anything like Hawaii. My younger brother Larry and I used to play outside when we lived in Hawaii. In fact my mom rarely saw us and we rarely saw her. We were climbing walls, trees, riding our bikes, catching lizards and geckos. We were hanging out with the neighborhood kids, chasing escaped rabbits from their cages, terrorizing smaller children, playing Dungeons & Dragons, Atari, Lego and all things wonderful and imaginary. We had an outdoor childhood and I’m grateful for it. In Barstow, we were in the middle of nothingness. It lacked color. The land was barren. It was a sandy off-white pit of despair with an abundance of tumbleweeds. You know in those Western movies where the tumbleweed blows across the screen? I’m fairly certain they got the idea from Barstow. Being of the exploratory type, Larry and I combed the sandy dunes walking side by side. We looked out at the rolling hills of sand and scrub brush, of beige where we once were surrounded by the greenness of tropical living but we continued on to the next set of hills hoping to find something different. We didn’t. We saw the occasional jackrabbit. We flipped over rocks searching for scorpions. We attempted to be careful of the cacti. We were cautious not to stray too far from home. We spent a lot of time at home. Larry entertained himself by watching cable television. He watched shows like Nature and other PBS programs. He soon became the subject matter expert on the habitats and feeding practice of all living things. This is one of the talents of my dear brother – sponge like ability to absorb information. Larry can recollect dates, times and seemingly minuscule facts to the great annoyance of other family members. His ability to recall has been used as incriminating ‘evidence’ for all wrongdoing against him. While I got stuck with the amnesiac flux gene that plagued me long before I ever inhaled, Larry should have been a lawyer or a Jeopardy contestant. We withdrew from the world outside. And while Larry could find some solace in front of the TV, I had to find something else or to use the teenage angst expression “die of boredom”. I remember when we drove to the nearby town of Victorville to go to the mall/civilization, I wandered into Waldenbooks. I scanned the sections before heading to Young Adult. There I found books to my liking. At the bookstore I didn’t reach for the Encyclopedia Britannica or books on High-energy physics like all the other Asian kids, I reached for Sweet Valley High. I read the Sunfire (still have them), Couples, Cheerleaders, Sugar and Spice, Chose Your Own Adventures, Seniors, Sweet Dreams and Nancy Drew series. They were the best books. In fact, I can barely continue writing because I’m so excited. I want to pick up one of those Sunfire romances and dig in and read about a heroine in a historic setting. She’s brassy, headstrong, and has to choose between two men! Oh yay. I can share this one with the 10 yo. Good stuff. AAAAAAH, I LOVED Sweet Valley High! I gotta look into this Sunfire you speak of. You make it sound so intriguing! Unfortunately they are in a box in a barn in Alabama! OH MY GOODNESS GRACIOUS! Great minds really DO think alike. I was just wikipedia-ing (yep, I verbed it) Sunfire. I’m SO gonna add this to my MUST-READ book list! (which is already way past the 100-book mark–not to be mistaken with 100 bookmarks) Man, I wish us humans didn’t need to sleep for optimum health. Ah yes, good point … sleeping and dreaming IS pretty awesome. Oahu to Barstow…WOW, what a change! I went to K-8 schools, and I thought changing schools for 6th grade was hard. You’re right, we do have quite a bit in common…gonna follow. Oh, wow, we’re really long-lost sisters! I was kind of similar back in high school. One of these days, when I have the time, the repaired laptop, and finally done with all the others things I have in line for posting, I’ll write a more specific post about my so-called novelettes. I mentioned this in my own beginner’s story but in less details.